At its best, on a sky-blue day on a nice course, golf is fun. And even on the toughest of days, the irony of the game is this: The more serious you get about playing it, the more fun-atical you get about enjoying it. That’s the word — fun — that best describes Grand Canyon University Golf Course, which opens to the public Friday, almost a year to the day after the beginning of the transformation of the old Maryvale Golf Course into a championship par-71 layout. It’s a challenge for good players without punishing them, and it allows high-handicappers a chance to make par or an occasional birdie without boring them. It’s fun for the budget, too — during the prime golf season in Arizona (September-May), it’s only $30 Monday-Thursday and $35 Friday-Sunday for Phoenix city card holders and GCU employees and students, and for the general public it’s $35/45. It’s even less expensive during the summer. 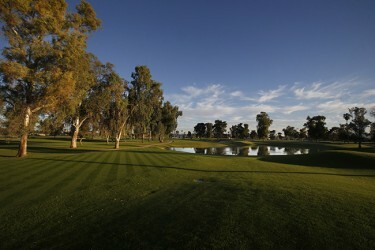 Tee times are available at www.gcugolf.com. ● Fair: Good shots are rewarded. Bad shots are punished but not necessarily with brutal penalties, and you still have a chance to recover most of the time. 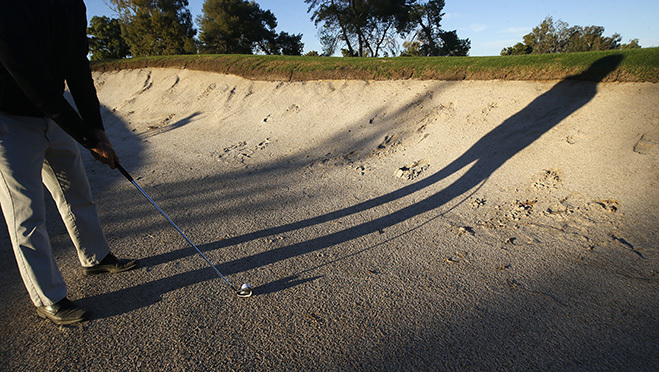 However, it’s a good idea to steer clear of the bunkers — they can be deep trouble, literally. ● Functional: The course is in great shape and can be played quickly. You can find your ball just about wherever you hit it. The greens are pristine and fast (11 on the stimpmeter) but don’t have an inordinate amount of break. There’s hardly any distance from the green to the next tee, so it’s very walkable. There’s enough undulation to give you some tricky stances, but you won’t get worn out climbing hills. ● Fresh: It’s a Midwest-like breath of fresh air for Valley golf. If you grew up playing the game in the central U.S., you’ll feel right at home. 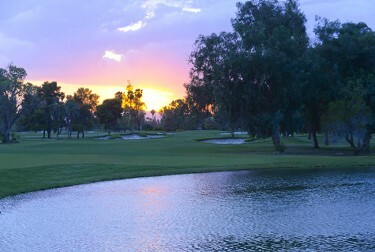 Unlike just about every other local course, it has lots of mature trees and zero desert brush. If you didn’t know you were in west Phoenix, it could pass for the Corn Belt — except for the occasional palm tree. ● Friendly: To your driver, that is. Sure, there are a few places where a fairway metal or a long iron might be a better idea off the tee, but there isn’t a single par-4 or par-5 where the driver has to stay in the bag. Out-of-bounds fences are rare, and it takes a seriously off-line shot to reach them. Let the big dog eat. Swing away. ● Flexible: There’s such a wide variation in the distance from the five sets of tees, the course is at least five shots tougher if you play it from all the way back. Fairway bunkers that can be cleared from the middle tee are very much in play from the back, and the extra yardage turns short irons to the green into long or middle irons. No. 1, 547/496 yards, par-5: The ideal opening hole. Right from the start, you get an introduction to strategically placed fairway bunkers that you want to avoid if you’re going to score. But this dogleg left is pretty straightforward for a good player — it’s a birdie hole. No. 2, 198/167 yards, par-3: Here’s your introduction to another feature of this course — optical illusions. The flagstick looks as if it’s too short, but that’s because the green is about 40 yards behind a big ridge. This is one object that’s farther away than it appears. Take an extra club. For example, if you’re thinking about hitting a 5-iron, go with the 4. No. 3, 426/407 yards, par-4: The course is a nice mix of left-to-right and right-to-left drives, and this is the first one where a bit of a right turn on your ball is a good idea. Don’t be long on your shot to the green or you’re in the water. No. 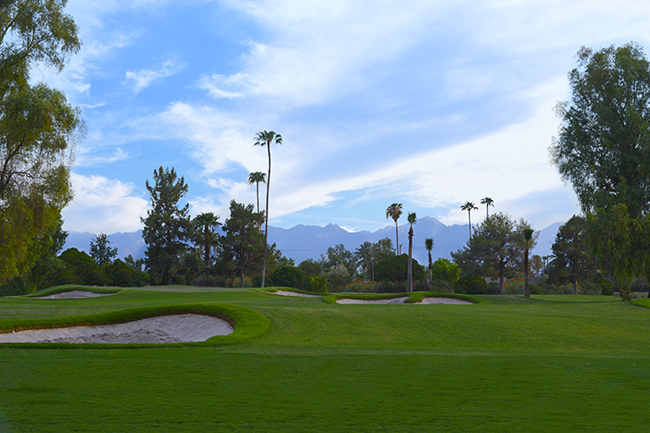 4, 151/143 yards, par-3: Sure to be one of the most photographed and memorable holes on the course. The green was moved to the right to bring the water more into play, and that plus a yawning bunker in front of the green makes this one of the most interesting shots of the day. Short hitters should aim left and use the path into the left side of the green. No. 5, 337/310 yards, par-4: A new trend in golf course design is the occasional short par-4 that’s reachable from the tee, and this is the first of a pair of them at GCU Golf Course. The only trouble is the bunkers, so the reward outweighs the risk. But watch out for a green that gets skinny in front and in back. No. 6, 365/336 yards, par-4: The fairway bunker on this dogleg right can be cleared by a decent drive from the middle tee, leaving you a wedge in. But don’t hit your tee ball through the fairway or you might reach the water on the left. No. 7, 386/348 yards, par-4: How you play this hole depends on what tee you’re using. From the whites, the bunkers across the fairway are reachable for a big hitter. From the back tee, you probably can’t get there. Left of the green is a valley of sin that requires some creativity, such as a bump-and-run, to get a chip shot to stay on the green. … No. 9, 513/468 yards, par-5: Lots to love about this hole. There’s the drive, which presents another optical illusion — the bunkers look as if they’re one after another as you stand on the tee, but when you get up there you can see that once you clear the first bunker, the rest of the sand is down the fairway and the seemingly tight hole opens up. The green, reachable in two with a big drive, is an amphitheater-like setting in front of the clubhouse. But if you go long your ball could be bouncing into someone’s salad at the clubhouse restaurant. No. 10, 454/415 yards, par-4: The first of four holes on the back nine that easily could be the No. 1 handicap hole on the course. This used to be a par-5, but the redesign made it a long par-4. Indian School Road looms left if you hook the ball, and there’s a lot of real estate to cover if you’re going to putt for birdie. No. 11, 185/175 yards, par-3: One of the easier holes on the course if the tee is up, but this is an interesting shot from the back tee. You need to make par here because there are bigger challenges ahead. However, if the pin is cut on the left side of the green and your ball is on the right, get ready for one of those lightning-fast putts that you just have to touch to get the ball to the hole. No. 12, 567/517 yards, par-5: Longest and most adjustable hole on the course. If you’re playing the middle tee, turn around and look at the tiny mound … way … back … there. It looks as if the back tee is up against the fence fronting Indian School Road, and from there it’s a 642-yard monster. But it’s plenty long enough from every tee, and every shot is a test. No. 13, 334/293 yards, par-4: From long to short again — another reachable par-4. This is a chance for glory that you don’t want to pass up, but if you miss on either side of the green you’re going to have a dainty little flop wedge over the bunkers. No. 14, 414/385 yards, par-4: Beware! The pond on the left is partially hidden from the tee, but it most definitely comes into play — as do the bunkers on the right. You’ve got to carve your drive from right to left unless you lay up with less club. And if the pin is up, your wedge has to be just about perfect. No. 15, 400/362 yards, par-4: Avoid that big bunker on the left at all costs unless you want to try a shot that will test your ability to get the ball airborne in a hurry. If you can get your drive in the fairway, the second shot isn’t too daunting. No. 16, 454/412 yards, par-4: Another candidate for toughest on the course, mainly because the water comes into play on the second shot and the huge green has lots of potentially problematic pin placements. Go left off the tee on this dogleg left and you’ll be trying to punch a low shot out of the trees. No. 17, 188/179 yards, par-3: As tough as No. 4 is, this par-3 is even tougher. It’s a longer shot, anything to the right is in the water and hitting out of the deep bunker in front of the green is almost like hitting out of one of those pot bunkers in Scotland. Truly a challenge. No. 18, 417/376 yards, par-4: Like No. 9, a great finishing hole — and this is the No. 1 handicap hole. It’s the only one on the course that has out of bounds on both sides of the fairway (the driving range is on the right). However, there’s enough room to hit driver and not be too nervous about keeping it in play. The contour that was added to the fairway can make the second shot uncomfortable. There’s more to do after your round or even if you’re not playing golf: The new 22,000-square-foot clubhouse is a welcoming place where you can take in the green scene while eating at what promises to be a top-quality restaurant with students providing GCU-style service. This is a high-end experience for one of the Valley’s lowest championship course green fees. The condition of the course alone is a selling point, but there’s much more to it than that. Sound like fun?